Eliminate costly breakdowns and repair with regular a oil change. Have you ever experienced a car breakdown? Frustrating and inconvenient, no matter where or when it happens. You know it will mess up your day or maybe even a special night; causing disappointment for your and your passengers. Not only that, depending on where and when you break down, it can be down right scary and even dangerous for you if you are alone. No one wants to think about their vehicle breaking down, and if it hasn’t happened to you yet, then it’s time to take precautions so you never experience car breakdown problems. One of the reasons for car breakdowns are failure to regularly change the engine oil. Regular oil changes keep vehicle engines running smoothly. Over the past decade, vehicle manufacturers have increased the recommended period between oil changes; the intervals are different depending on vehicle, yet even the same vehicle can have different recommendations depending on which country you live in and the areas particular environmental protections. These schedules are usually adequate if the car is driven in ideal circumstances, although most European car manuals do make reference to adverse conditions. What are ideal circumstances regarding Oil Change? What is called "adverse conditions", are actually quite normal use, but from the standpoint of the engine oil, it is quite severe use. Under these conditions, it is likely that your car service schedule needs to be adjusted accordingly to avoid costly consequences. While your manual may generalise the oil change recommendation, your car servicing and repair shop will have the best solution based on custom questions the mechanic will ask you (beware, not all shops offer this custom service). Because of all the variables and since the oil nor the engine can tell us when they need to be changed, many estimates are just guesstimates. This is why having a trusted mechanic that you visit regularly is the best idea. It’s akin to going to your doctor when you are in need of a check up. Your doctor knows you intimately, as your mechanic knows your car intrinsically. What are the consequences to extending the period of time between oil changes? This extended interval in recommended oil draining have been shown to increase engine wear by at least 20 percent. This also causes a reduction in horsepower and fuel consumption. Depending on whether you are operating the vehicle under ideal conditions or not, what exactly is the correct interval? With out a mechanic you trust, it might be difficult to find the answer you need concerning lubricating your engine. A search on the web reveals European car owners often receive conflicting advice from quick-lube shops, vehicle owner’s manuals, dealerships, auto parts stores. Unfortunately, incorrect advice may conflict with the car manuals or even go against conventional wisdom. When you are looking for a mechanic shop to perform an oil change, how do you know which shop to choose, a quick lube or a shop that offers the most complete services? At some point, as preventative maintenance, a complete range of quality servicing options for your car should include a fixed price servicing and manufacturer’s scheduled log book service. There are two one stop shop options for oil changes. A one stop shop that covers all car servicing & repairs, log book servicing, installations & all your auto electrical needs. Or, the alternative, a drive in oil and lube job. Which one is healthier for your expensive vehicle investment? Well it turns out, sometimes prevention is worth a pound of cure. You might only be in the mood for an oil change, but during that change, the mechanic might notice something that needs attention, saving you a breakdown and money in the long run. Kind of like when you visit the doctor for a checkup, and he finds something more pressing that if treated immediately, will save you from getting really ill. That won’t happen at a drive in oil change joint. Would you rather find a car problem before it happens or after? Finding a shop that provides quality service, workmanship, and parts as well as a customer friendly environment isn’t easy to find these days. Finding a shop you can trust, only happens if you have experience with that shop, or have learned of them by reputation. 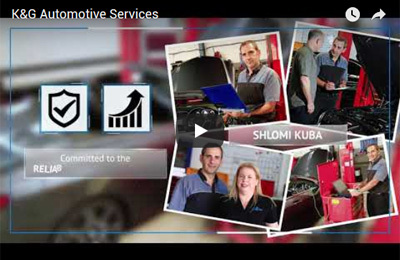 When you find a car servicing shop that is proud of their modern, clean, fully equipped workshop, you’ll hear them boasts the latest technology in diagnostic equipment and tooling. That’s probably a shop you could trust with your European Car Investment. You are probably paying a lot for your vehicle, so you want only the best mechanic hands touching it. Right? Try us out just for an oil change and we think you’ll be impressed. At K and G Automotive, we can look up your car and tell you about known problems for your specific make and model. Many car problems can be avoided if you know about them beforehand. While no one wants their new car to have problems, many do occur in the first year of use. When we discover a potential problem within the warranty period, most times it can be fixed free; we use the warranty to guide us in these determinations. Of particular importance, we can also tell you about potential problems that most dealerships won’t be thinking of which could prevent your car from breaking down, especially for those times after the warranty runs out. Do you know why you need to change the oil? Factory recommended scheduled maintenance include regular oil changes and car inspections. Sometimes knowing the why of something, instills understanding to we remember. So, why does oil help a car engine? New engine oil keeps everything in your engine running smooth. It reduces friction causing less wear and tear on pistons, allowing them to keep firing and sliding up and down the cylinder walls–performance perfection. While your car is in for the oil change, we will check your car for scheduled maintenance. If our mechanics find areas of weakness that are close to failure, we will seek your counsel before we innate repair services. Standard inspection of belts, hoses, spark plugs, ignition, fuel injectors, brakes, tires, alignment and other inspections, critical to proper automobile operation, are checked to make sure your car is operating properly. Break downs are a sudden unplanned expense, as can be roadside assistance if you don’t have a plan, add to that engine parts and the cost of labor. At K and G Automotive, we want to help you prevent car breakdowns the best we know how. One of the most important tips we can share is to keep your car running to performance perfection. Even in the age of cell phones, if you are not performing preventative car maintenance and oil changes on your European or German car, be it a BMW, Audi, Volkswagen or Mercedes Benz, then you just might find yourself stranded somewhere on a dark stormy lonely night. We definitely don’t want that to happen to you. Call us with your questions, concerns or just chat with us today and we will show you how to save money and keep your treasured vehicle in tip top shape.